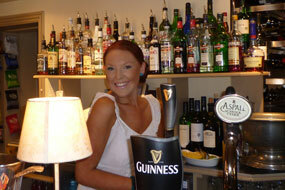 The bar at The Whalebone is light, bright and friendly. Big windows let the light in during the daytime and the checked blinds are pulled down to create a cosy warmth in the evenings. There's plenty of space and a lively atmosphere! Whether you want to hover by the wood burning fire or settle around one of the tables with a couple of friends for a chat, you'll feel right at home here - just name your drink and relax! 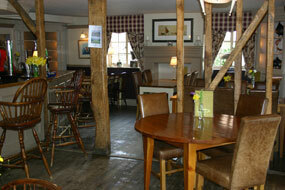 It's a free house so you'll find a good selection of real ales and an impressive wine list. Of course, if you get peckish there's plenty on the menu to make your mouth water - from bar snacks to mouth-watering starters, main courses and desserts. You can see what's available over the fireplace (and you shouldn't need your glasses, as the menu is printed big and bold). You can choose to eat in or out; just tell the bar staff where to find you. While you're making your mind up, you might choose one of the great wines from the adjacent wine list (you can't miss it as it's painted on the wall)! There's something for everyone - just come on over and join us! "Thank you for a delicious meal when visited at lunchtime this week."